These screens use images, anecdotes and also music to provide an insight into monastic devotion in the church. Information about the appearance of the church – the layout and decoration – can be found in the Cistercian church. The monks’ day was structured around the eight Offices, known as the Canonical Hours, which they celebrated in their choir. The monks also entered the church to attend a daily Mass, to receive Communion, and for special occasions such as dedication ceremonies, funerals and the unction of the sick. A large proportion of the monk’s day was therefore spent in church, and even part of the night for the community assembled in the choir stalls c. 2 am to celebrate the night office of Vigils. Whereas the Black monks of Cluny celebrated up to 210 psalms a day, the Cistercians celebrated the psalmody of 150 psalms over the course of the week, as prescribed in the Rule of St Benedict. Simplicity and uniformity stood at the heart of Cistercian ideology. They considered complicated and lengthy services excessive, and also a potential cause of boredom and sloppiness. Quality, not quantity was the decisive factor, and devotions were therefore to be kept as simple as possible. 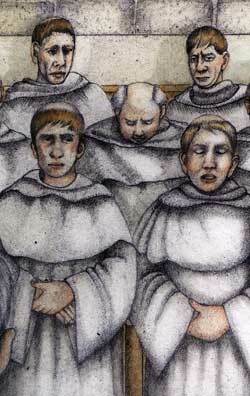 The Cistercians reduced the number of masses and processions, as well as the length of the psalmody, and ordered that the monks should sing devoutly, like men, without shrills, trills or musical instruments. To ensure that the form of worship was the same in every Cistercian abbey, in other words, that there was uniformity of practice, the General Chapter ordered that the same prescribed liturgical texts should be used by each community. This meant that if a Cistercian monk visited another abbey of the Order he would be able to take his place with the host community and follow the services there, just as if he were in his own abbey.